I’m not sure about making New Year’s resolutions to myself – I’m not sure I even believe in the repetitive cycle of new year old year new year old year. We actually had a Happy Old Year party on Tuesday this week and that felt good. Sometimes you just want to go against the grain, to go with your own flow, and it’s with that spirit that I’m entering a new Time Zone. Because I feel as though last year was a fallow year, like when farmers leave a field in fallow to rest and then the following year the crop will be better….so following my fallow year I’m hoping my crop will be healthy and better and more tasty. And so I’m kicking it off with six weeks in Make A Solo Show Bootcamp !!! And I hope you will come and see the results !!! It’s like when someone has a second midlife crisis because the first one was so good, but this time they really want to get to the bottom of why they are still not happy. This is what happened to me during of year of thinking I wanted to be happy but actually that wasn’t what it was all about, that would be too simple wouldn’t it! It’s the sequel to ‘Hi, Anxitey’, and maybe I should have called it ‘Hi, Happiness’. I hope you’ll be part of it because stuff only comes alive when it’s in front of an audience really and that’s you. Over the next six weeks I’ll be in showtime bootcamp, getting ready to welcome you to ‘A Place Called Happiness’ at the Contact Theatre on Wednesday 10th February. Click to book your tickets here. Don’t know what its all about by I can’t seem to let go and sleep deeply, the voices in my mind are chatting away to me most of the night, I thinks its coz lots of stuff is going on in the making of something . I’m gathering conversations, remembering connections with strangers, snippets of other peoples lives, and I feel very here, turns out I don’t need that much, turns out I’m not alone, turns out most of our Happiness is very simple this…. So I am doing a sharing tomorrow in a studio space here at the Albany, no lights no tech, no theatre, just me, some stories, some film, some documentation,some sounds. After its done, there will be more I hope. 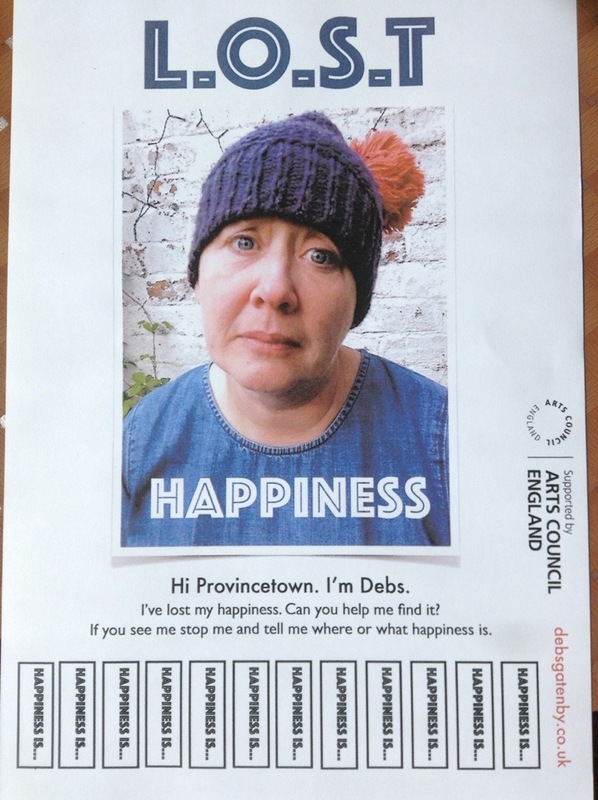 I will be at the Albany Deptford for the week of 26th October working on (playing with) my next show ‘A Place Called Happiness’,I cannot wait. It’s always good to get away but even better to have somewhere to go to work from, and I love the Albany its got soul and a proper neighbourhoody feel about it. Feeling positive and open to what ever will happen, and I plan to not make plans but to get lost and found and let stuff happen ! If anyone is passing through do let me know …and if anyone knows about any wild untamed secret bits of the Deptford area please let me know!!! I can safely say that right now happiness is not being on a 8 hour flight with heavy turburlance, that it is just generally being still alive! But on a more serious deeper note it’s about cleaning your teeth in a clean bathroom, it’s having a shower putting clean pants on, coffee , and being surrounding by people from all over the world in a Hostel in Boston, being communal but also having your own little bit of space to be human, to be considerate to practise being who you are . Can I just say I am deeply jet lagged and so sorry for sounding a bit cosmic but I haven’t slept since Friday eve. Over and out for now. And it’s off to the Isle of Eigg I go! Cannot wait to be beginning my journey tomorrow – Happiness (research) Stage 1! There’s the small matter of a 32 hour journey involving cars, boats and even a tractor but I can’t think of anywhere I’d rather kick off the research for my new show. 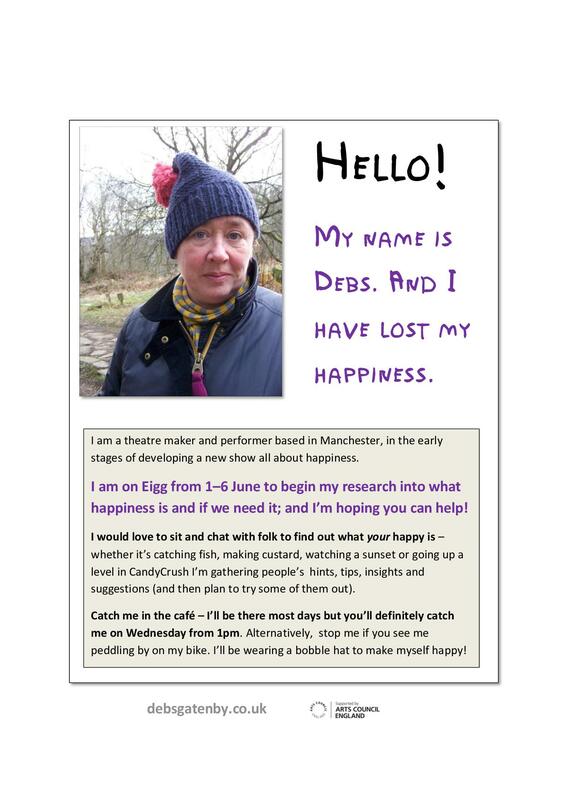 Hoping to have some great conversations with people to find out what happiness means to the folk who have made a small island community their home. I do hope some of their happiness rubs off on me as I wander about with my notebook and clipboard. Eigg, watch out. Manchester, I’ll miss you! News from the other sofa, in the backroom. Yippee, I’m getting away to the Isle of Eigg, a Scottish Island remote and few people a wild self sufficient place, I cannot wait.I’m hoping to find out stuff about stuff for my next show. A show about stuff and people. I think being alone will be good for me. I think being the only person walking along a coastal path getting my thoughts blown out of my mind will be good for me. I might grow a beard. Learn how to knit or spit or catch a sheep or fish or cold. I might find new words. I might go veggie for a week. I might swim in the sea wearing my knickers. I might go there mad and come back sane. I hope not. If anyone wants to set me a challenge while I’m there then do, I will put it on my list of things to do. Thank you . Wishing everyone a peaceful day without regrets, with moments of wasted time and patches of daydreaminess. Okay the sun is starting to poke about on a more daily showing, and to most people it seems to have this switch effect like someone just switched on the Happy Button. Which is great, it really is, but I’ve realised that I’m not one of these people and I need more to switch my Happy Button, and, well I’m coming out as a person who does not feel the sun giving me a sunny disposition, but I will try and go out in in and sit and feel its heat……but sometimes if you feel low the sun can actually make it worse, and you gotta laugh. My Mum can come down in many environments, she is a expert she can let a room bring her down, lighting may bring her down, too many trees can bring her down, she is professional, our street actually brought her down on Easter Monday, yep our lovely little street!But I admire her honesty, she is real she is totally being herself. So what am I trying to say today,that maybe Happiness is a little shallow, its a shallow pool too shallow to swim fully in but you can lie in it and splash about if you need to…..I’m trying to reflect on a morning spent reading experts advice on how to have a happy life, there are people making really good lives out of telling showing others how to be Happy, business is good. I am taking it all in, do I sound sarcastic ? OOops maybe I do, but this is me, and happiness is complicated, and that’s why I’m gonna make a show about it, I need something to counter balance my amazing career as Waitress of the Year, the pressure is too much, so I’m getting back into the Show Saddle. Go out and borrow things and make them your own…. I’m going to walk round the park and try feel the sun ..